C'est la plus fréquente des luxations. La diversité des méthodes de réduction illustre bien la difficulté qu'il peut y avoir à la réduire sans avoir recours à une anesthésie/sédation. C'est encore plus vrai en cas d'isolement extrême. Une méthode à connaître. Luxation d'épaule: Une méthode simple ? Acute dislocations of the glenohumeral joint are common in wilderness activities. Emergent reduction should take place at the site of trauma to reduce the patient's pain and the risk of vascular and neurological complications. A limited number of reduction methods are applicable in remote areas. The aim of this study is to present our method of reduction of anterior shoulder luxation that is easily applicable in remote areas without medication, adjuncts, and assistants and is well tolerated by patients. A prospective observational study was conducted during a 5-year period. The patients included underwent closed manual reduction with our technique. After each reduction, the physician who performed the reduction completed a standardized detailed history, and reexamined the patient (for acute complications). The patients were contacted 6 months after the trauma to investigate long-term postreduction complications. Diagram depicting the steps of our reduction procedure. The practitioner holds the patient’s wrist with the left hand (in the case of a left shoulder dislocation) and the patient’s elbow with the right hand. 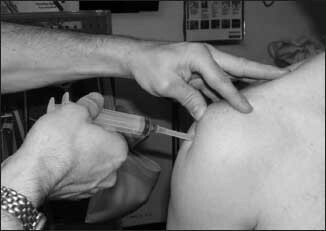 (B) With the elbow in 90° of flexion, the glenohumeral joint is flexed forward to 90°. (C) While still in flexion, the glenohumeral joint is adducted until the elbow reaches the midline of the body; it is important to continue this movement until this landmark is completely reached. (D) Then, internal rotation of the shoulder is performed. During this step, the patient’s elbow must stay at the landmark described above. At 25° to 30° of rotation, a mild resistance is usually encountered. (E) The last step of the maneuver consists of applying a constant internal rotation pressure to overcome this mild resistance without pain. Reduction is usually achieved at approximately 30° of internal rotation. Reduction was achieved with our method in 39 (100.0%) of 39 patients. The mean pain felt during our reduction procedure was rated 1.7 ± 1.4 (on a scale of 10) using the visual analog scale scoring system. No complications were noted before or after the reduction attempts. We did not find any long-term complications. The reduction method presented in the present study is an effective method for the reduction of acute shoulder luxations in remote places. Our data suggest that this method could be applied for safe and effective reduction of shoulder dislocation.